Enjoy all the comforts of this amazing brand new 5 bedroom townhome, will accommodate comfortably up to 12 people! This spacious home comes with a full kitchen with dishes/cookware, stainless steel appliances, granite countertops along with bed and bath linen. 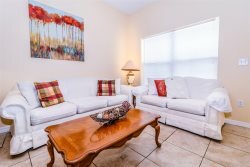 There is a patio area that is perfect for relaxing or spending time with your favorite people, and your will have your own private pool to cool off in after a day at the theme parks. This is definitely the best option to create the story of a perfect vacation with family and friends.